I tried to write Josiah's birth story last week, but lost it after getting nearly to the end (because I accidentally closed the web page when I switched to another tab). So here's my second attempt (now being written safely in a text editor on the computer and NOT on the Internet!). As many of you may remember, I really wanted a natural birth with Zak. 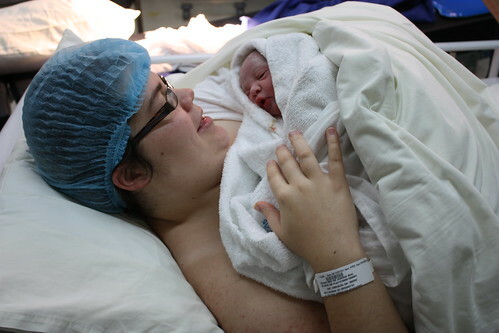 I was working with midwives and planning a homebirth when we found out at the end of the pregnancy that he was breech. We tried many methods to try to turn him, but nothing worked, and I had a scheduled c-section (only scheduled a week ahead of time, but still, scheduled). I never went into labour. Raoul's birthday is the 20th of July. Raoul wasn't feeling very well and thought he was catching the cold that Zak had the last week or so, but decided he was well enough to go out to eat for his birthday dinner. We went out to eat at Manuka with our wonderful friend, Irene, and had a great time. Unfortunately, Raoul was feeling worse that night and he hardly slept. In fact he was up working on his computer from about 4-6 am. He was only just beginning to get a bit of sleep when I woke up to my water breaking at about 7:30. I woke him up by saying the classic line, "Honey, I think my water just broke." I quickly rolled out of bed and waddled for the bathroom as I told him, "My water DEFINITELY just broke." (We're talking a flood, not a trickle.) Raoul says his first thought was, "Does it have to happen NOW, I'm just getting to sleep! ", but he didn't say it out loud, and thanks to a bit of adrenaline, he was wide awake and taking charge in no time. Thankfully although we weren't really prepared for the eventuality of me going into labour before my scheduled c-section, both of us kept our heads on straight and didn't panic about anything. Raoul called the maternity ward and let them know. They told us to come in (of course), and called the doctor for us. Then Raoul called the neighbours (who are also friends from church), and asked them if we could drop Zak off with them. Naturally they said yes (they had already volunteered to watch him when the time came anyway), so Raoul got Zak up and dressed and took him over. During all of this. I was just trying to get the flow of waters under control enough to clean up and get ready (not easy when there's no hot water). Finally I managed to get dressed, and Raoul grabbed the baby bag (which was thankfully completely packed already thanks to my hunch that the baby might come early), the camera, and my bag (which was only mostly packed, so we had to grab a few things and ended up forgetting my toiletries). With necessities in hand, we headed for the hospital. On the way to the hospital, I started having a couple contractions. We got to the hospital at about 8:30, and as we walked in our doctor was walking towards us from another direction. He stopped and asked, "So it's really today, hey?" Yep. After confirming with me that I was sure my water broke ("Yes, I'm SURE it broke. "), he said that we would be meeting our baby in the next few hours, and that we could head straight up to the maternity ward to get me settled (and that Raoul could come back and do the paperwork later). We went up to maternity and introduced ourselves. The nurse asked if I wanted to stay in a general ward (4 beds) or a private room. Since we didn't want to pay extra for the private room, we opted for the general ward. It turned out that baby decided to come at a good time though, because both general wards were being deep cleaned at the time and were unavailable, so I was able to get a private room for no extra charge! Whoo hoo! After being escorted to my room, I changed into the hospital gown and got hooked up to a machine that monitored my contractions and baby's heartbeat. After that it we just had to wait for the anaesthetist to arrive, and it would be baby time! The anaesthetist showed up at about 10:45, and it was time for Raoul to get scrubbed up and for us to go to the operating theatre. As the nurses, paediatrician, anaesthetist, and assisting doctor scurried about getting things ready in the theatre, several of them asked us what the gender of the baby was, to which we answered, "it's a surprise!" Everyone began sharing their guesses according to their different philosophies about boy vs. girl pregnancies and delivery. The assisting doctor said that it tends to be boys who come at unexpected times, but since it was still quite a convenient time, it could be a girl. 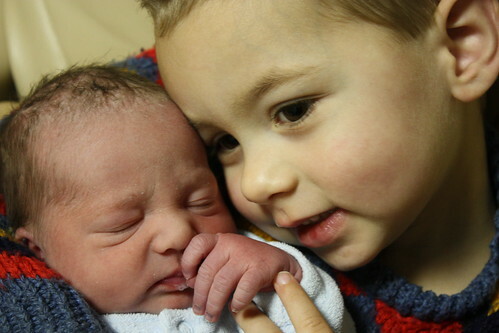 After hearing that Zak thought it was a girl, she decided it must definitely be a girl because siblings were almost always right at guessing the baby's gender. The paediatrician on the other hand asked us if it was harder to decide on a boy name or a girl name. We said the boy name was harder, and he said "Ah, well then it's definitely a boy!" As for me, I was pretty convinced it was a girl. The pregnancy was MUCH different (and much less pleasant) than my pregnancy with Zak- I had different symptoms than I did with him, I was carrying differently, Zak thought it was a girl, and I had a feeling he was right. Raoul insisted that Snymans only have boys (but admitted that he continued to say that mostly just to get a rise out of me because I'd like to have a girl someday too). 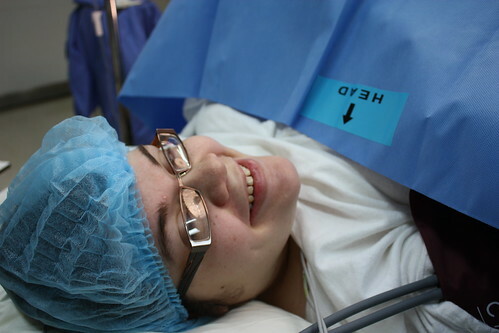 While people were chatting about the baby'd gender, the anaesthetist placed the drip and the spinal block (and did an excellent job I might add) and I got settled on the operating table. Time to get baby out of there- let the slicing and dicing begin! When the doctor opened me up, after a couple minutes he asked me if I had many problems with infection after my c-section with Zak. I was a bit surprised because I didn't have any infection at all, and told him so. The doctor said I had so many adhesions it looked like someone had poured in a bottle of super glue. They really had to work to get down to my uterus so it took a bit longer than it normally does. Finally it was time for the big moment- getting baby out and finding out if this little person was a boy or a girl. The paediatrician was watching the operation and asked if he could announce the gender. I gave him the go-ahead and...."It's a boy!" (Wait a second...boy? Yep. BOY!) They held him up for us to see, then quickly whisked him over to the incubator to do his APGAR observations, weight, and length. 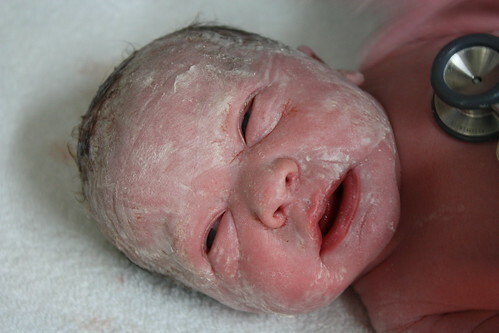 He was 3.31 kg's (7 lbs 4 oz), and 50 cm long (19.7 in). His APGAR scores were 9 and 9. It only took a moment, and then I was holding Josiah for the first time. I've loved the name Josiah since I was 14 or 15 years old, and now I was holding my second son, my own little Josiah! During my pregnancy, I was afraid that if the baby turned out to be a boy that I might be disappointed, at least a little bit. It turns out I needn't have worried. I wasn't disappointed, and actually, I wasn't even as surprised as I thought I would be if it turned out to be a boy. Nope. I just held my son, and I loved him. Of course, I knew I would love my baby no matter what, but I didn't want there to be any disappointment at all, even just for a moment. Thankfully God knows much better than I do, and there wasn't any. God knows who each member of my family should be, and Josiah is right where he belongs. God blessed us with a second son, and I'm so thankful- how could I be disappointed with such an awesome gift?! Unlike my c-section with Zak, when Raoul and the baby had to leave me to go to the nursery while I was getting stitched up, this time Raoul and Josiah got to stay with me the whole time. I handed Josiah back to Raoul while I was getting stitched up (because holding a baby while flat on your back isn't very comfortable), but as soon as they were finished and I was taken to recovery, I got to sit up more. The nurse unwrapped Josiah from the towels he'd been bundled in, and helped me get him settled against my chest, skin to skin (which is something I was never allowed to do with Zak in the hospital). I was even able to start breastfeeding while we were in the recovery room. It was an absolutely wonderful experience! So there you have it, the birth of Josiah! Oh, and by the way, for those of you wondering about the name, Josiah (depending on where you look) can mean the Lord supports, and/or the Lord saves, and/or the Lord heals (and variations of those)- all wonderful meanings that are important to us. We really pay close attention to the meanings of names when we pick names, which is one of the things that distinguished the name Josiah from the other names on our list. Now we have Zachary (Jehovah remembers), and Josiah (the Lord supports, saves, and heals). Praise God!